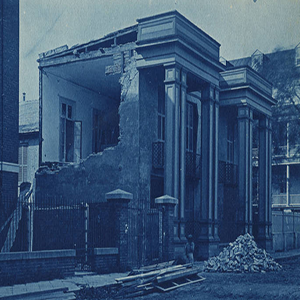 On August 31, 1886, Charleston and surrounding towns suffered extensive damage from the largest earthquake to ever hit the southeast. The photographs in this collection show the aftermath of the earthquake shortly after it occurred. George LaGrange Cook, a prominent Charleston photographer created the series “Cook’s Earthquake Views of Charleston and Vicinity” which featured a total of 200 photographs that could be purchased as souvenirs. A portion of this series, along with earthquake photographs from photographers William Wilson, W.H. Fairchild, J.H. Wisser, and Joseph Hall are featured here. Also, reports, maps, and geological surveys conducted by The U.S. Department of the Interior and The U.S. Nuclear Regulatory Commisson published in 1888, 1977, 1983, 1986, and 1991 are contained within the collection.